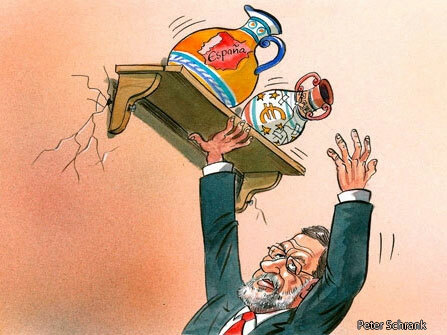 Spain’s prime minister battles against the break-up of the euro and his country. A Galician, the Spanish like to quip, is the sort of person you meet on the stairs and you don’t know whether he is going up or coming down. Such ambiguity, or retranca, can make for entertaining and ironic speech, and an attitude of caution, even suspicion. For Mariano Rajoy, the Galician-born Spanish prime minister, playing to this archetype is a way to survive and manage conflicting demands. Whether it is the character trait Spain needs to overcome its agony is open to doubt. Mr Rajoy frustrates many with his prevarication over a fresh euro-zone bail-out, which now comes with a conditional promise from the European Central Bank (ECB) to help bring down Spain’s stifling borrowing costs. France wants him to take the money; Germany tells him not to. Before walking through the door Mr Rajoy wants to know that Germany won’t shut it on his fingers, and to be sure about what lies beyond. What will the ECB do, and what conditions will be imposed on Spain? Asked this week about a leaked report that a bail-out request could be imminent, Mr Rajoy responded with Galician retranca. There are two options, he said: either the news agency is right, and it has better sources than the prime minister, or it is wrong. “I will tell you ‘No’. But you can still think what you deem best, because you may guess right.” So did he really say no, or was it a yes?